EAST TEXAS (KLTV/KTRE) - Good morning, East Texas! Here’s the weather where you live: A mostly cloudy day today with slight chances of showers and temperatures in the upper 60s. 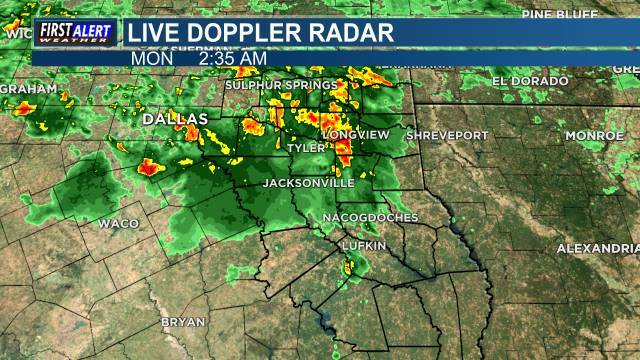 Overnight tonight we are expecting showers and thundershowers to begin making their way into East Texas. Tomorrow widespread showers and isolated thunderstorms are expected mainly in the morning hours with slight clearing into the later afternoon. The biggest threats as of now will be very gusty winds and brief periods of heavy rainfall. Temperatures will be on the warm side, climbing to the low 70s. A cold front comes through late on Wednesday and will take away the clouds and wet weather leaving us with sunny skies for Thursday. The sunshine will stick around for the rest of the week, into the weekend, and even into the start of next week! Temperatures will slip into the 50s on Friday and Saturday but will rebound back into the 60s after that. Enjoy the sunshine!